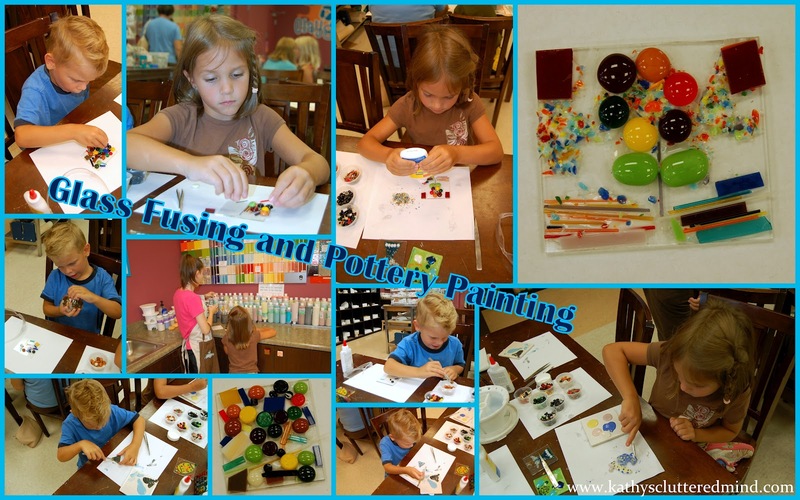 My Clayground is an art studio in Roswell, GA offering pottery painting, glass fusing, mosaics, clay sculpting, and canvas painting. This place was much bigger than I had anticipated. The walls and shelves were filled with beautiful creations, blank pieces waiting to be turned into works of art and lots of fun supplies like paints, brushes, glass chips and more. I kept our field trip a surprise. When we pulled up the kids could tell we were going to a FUN place just by looking at the outside. While I gathered some things out of the car they peered at the works of art through the large display window and oohed and aahed. Finally I let the cat out of the bag and explained we were going to make sun catchers using different types of glass pieces. This was the perfect project to go along with our unit study on sand (which of course is covering glass since glass is made from sand). Since we had made arrangements in advance our supplies were set up and waiting for us. The cheerful staff member led us to our table and explained the glass fusing project to the kids. She provided them with examples to get their creative juices flowing. There were many different types of glass materials for the kids to use on their 3 x3 glass base. There were chips, pebbles (which look like Reese's Pieces), stringers, frit, etc. The staff member was always available if the kids or I needed assistance. She stopped by to check on us and complimented the kids on their creations. Both kids had lots of fun. Gwyn my perfectionist and crafter created several different layouts before she finally decided on one she wanted to keep. Rowyn my non crafty child was fascinated by the colors and shapes and wanted to use every piece he possibly could. He insisted on covering up the entire 3 x 3 base which included stacking glass pieces as well. After they had their layouts complete they glued their pieces down and then were told the dreaded news....that they must wait a few days before they can see their finished projects. I had to explain to the kids that their projects had to be fired in the kiln so that the glass would fuse and look even prettier. We looked around the studio for a little bit and they convinced me they just had to do some pottery painting as well. So they each picked a small clay piece off the clearance rack and enjoyed some pottery painting fun. After 3 days our pieces were ready to be picked up. The kids were very excited to see their finished creations. The sun catchers will be hung up in a window and the other two pieces are going to be made into necklaces. All of the projects are as simple as 1, 2, 3! Even a non crafty person will have a blast. And this place is NOT just for the kids. You don't know how bad I wanted to create some works of art (this would be a great moms night outing). All projects that My Clayground offers are suitable for ages 6 and up. The pottery painting, canvas painting and clay sculpting are suitable for those younger than 6. Both kids, "Can we go back pleeaassee???" Gwyn, "I liked the glass fusing because the glass is so pretty and shiny. I liked the nice lady who helped us. If you get thirsty they have delicious juice boxes you can buy there too." -Your kids may not want to leave. -They accept walk ins everyday except Sunday. -It is important to speak with your kids prior to entering the studio about not touching the breakable items on the shelves. -Some of the glass pieces really do look like candy make sure kids who like to put things in their mouths are supervised around these items. -Pre-order promotions are starting now thru August 31st for Halloween items and clients get 20% off their order. Contact the studio for an order form. Christmas ornament pre-orders start in September. -Wear clothes that are okay to possibly get stains on. Aprons are available for you to use. -Explain in advance that certain projects will not be able to come home with you the same day because they need to be fired in the kiln. It normally takes an average of 5 days before items can be picked up (sometimes less, sometimes more). My Clayground will call you when they are ready. -There two very clean restrooms located in the back of the facility. -The facility is large enough for strollers and wheelchairs to maneuver. -GREAT place for a homeschool group field trip. 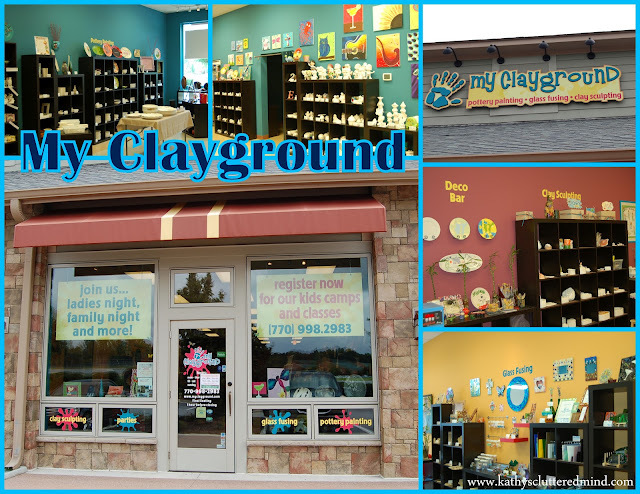 My Clayground offers weekly specials, classes and even parties. Right now you can even snag this SPECIAL offer at Plum District - $80 for a Canvas Painting Birthday Party for 8 kids. Varies depending on projects. There are pottery pieces to paint for as low as $3. Make sure you sign up for the email list and also "like" My Clayground on Facebook to receive special monthly promotions. 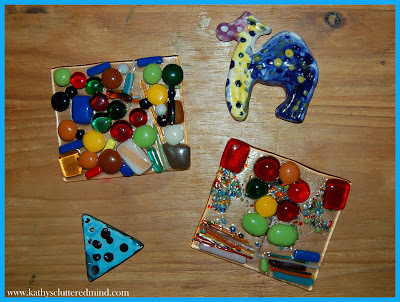 *Disclaimer - We received 2 glass fusing sun catcher projects in return for our honest review. Please note that prices indicated in the post are subject to change. I was not compensated for my review and all opinions are our own! Many of the links found on my side bars and in my blog posts are affiliate links. As a result, I might get paid money and I will most likely spend the money on homeschool supplies.